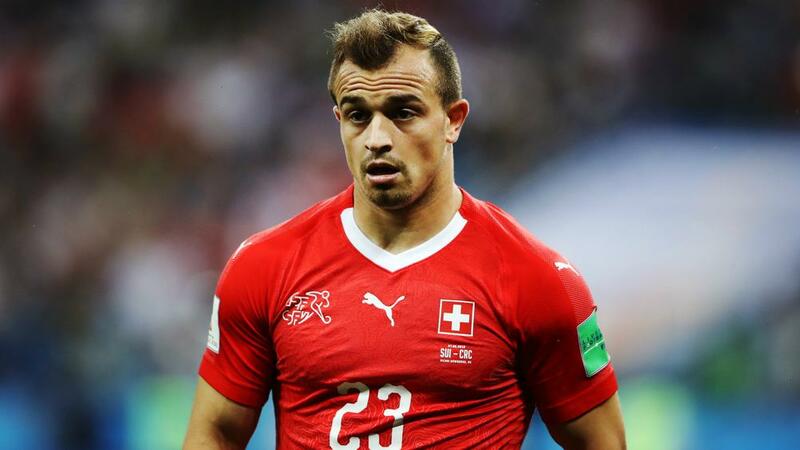 Switzerland thrashed Iceland 6-0 in their opening UEFA Nations League match as Xherdan Shaqiri played a starring role. The Liverpool winger scored his side's third goal and was involved in three others in the second half as Vladimir Petkovic's side ran riot in St Gallen. Steven Zuber blasted the hosts ahead 13 minutes in before Denis Zakaria scored his first international goal after Shaqiri's free-kick deflected off Fabian Schar. Shaqiri was credited with the third 53 minutes in when his free-kick glanced off the head of Birkir Bjarnason, who spent two years playing for Basel in Switzerland's top flight. Haris Seferovic scored a fine fourth, drilling home from the edge of the box after Schar sent Shaqiri's backheel pass into his path, and the Benfica forward squared for debutant Albian Ajeti to make it 5-0 four minutes later. Admir Mehmedi compounded a miserable outing for UEFA Euro 2016 quarter-finalist Iceland, his simple finish coming at the end of a swift counter-attack involving Shaqiri and Borussia Monchengladbach midfielder Zakaria. The last time Iceland conceded five goals or more was in their 5-2 loss to France at the European championship two years ago. It had not lost 6-0 since a FIFA World Cup qualifier against Denmark in 2001.